On the cover: Scholars and department chairs (left to right) Alice Tybout, Therese McGuire, Jan Eberly and Kathleen Hagerty are among the Kellogg faculty making key contributions to the school academically and as administrators. 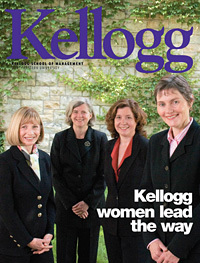 Three of the current six academic chairs at Kellogg are women, which is unprecedented at any major MBA school. Prof. Tybout is chair of the Marketing Dept., Prof. McGuire is chair of the Management and Strategy Dept., Prof. Eberly chairs the Finance Dept. (the third woman to head that department in the last 10 years) and Prof. Hagerty, a former Finance chair, was just named senior associate dean, faculty and research.